AUGUSTA, Ga. (WRDW) -- A local mom and her son have achieved great heights in education, but it didn't come easily. The pair recently earned their PhD's on the very same day, a goal that seemed impossible when their long journey began. "Never in a thousand, million, trillion years [did I expect to get my PhD]. The thought of becoming a doctor anyone was far fetched," said Dr. Maurice McBride. He got his diploma at a ceremony in Minneapolis, MN in August, but the day wasn't just about his accomplishment. It was about sharing the stage with his mother. "I never thought I would get chance to see my mother walk across the stage and then she turned around and saw me walk across the stage," he said. It was a day that seemed nearly impossible considering where they started. "At the age of 13 I got pregnant with Maurice," said Dr. Vickie McBride. She was a young mother growing up in Waynesboro. She said, "It was shunned upon and of course the older people in the community were whispering." But that didn't stop her or her mother. Vickie stayed in school while her mother, a retired teacher, helped out with Maurice. "As a teenager I continued my education. That was never an option," explained Vickie. She made it to college and graduate school all while raising Maurice and eventually 3 other children. "I had to figure out how to work and how to parent and how to manage school all at the same time." she said. Maurice had his own struggles. At just 16 years old he dropped out of high school. "[I] started hanging out with some of the wrong people and got into some trouble," he explained. After ending up in a juvenile probation facility he knew it was time to turn his life around. He said, "I picked up the bible and I started reading and I was like it all makes sense. I see how it actually comes to fruition. I see how I ended up here." He got his GED and then pursued a music career. Signing a record deal with Capital Records, but he never stopped his education. It was something that was instilled in him by his mother and grandmother. "As a recording artist I also attended school online," said Maurice. He kept going after he left the music world. He went on to graduate school, becoming a professor at Paine College and then one day he called his mom. "I said 'hey I think I'm gonna get my PhD. You wanna do this with me?' 'No that's okay. You bumped you're head, but you can go ahead and you can do it. I'm done with school'," he recalled. After talking it over, they decided to do it together. Vickie graduated with her PhD in K-12 Education and Maurice in Organizational Management from Capella University. "I didn't let my situation define who I was. I defined my situation. I looked at my situation and I told situation this is where we are going and this is what we are doing," said Vickie. A proud day for both a mother and a son. "I was so proud of him because I knew where he had come from," said Vickie. "This is who she really is despite what she's been through," said Maurice. "This is how I've always seen her and now I'm like 'hey look this is her' with the cape and the supermommy uniform." And they want their story to be a lesson to those struggling now. "For those who have gone through [tough situations]. You can be successful. You can be anything. You can do anything once you make up your mind that that is what you want to do. Set a goal and go for it," said Vickie. Maurice says he wants his mother to write a book with him about their story. He's also working to convince her to go to law school but she says she'll sit that one out. She just plans to be in the audience for that graduation. They are both working as teachers now. Vickie teaches middle school and college in Virginia and Maurice is a professor of business at Paine College. Mayor Michael Nutter joined Hart on Friday to visit four schools that collectively received 300 laptops. The district has endured severe budget cuts this year, including the closure of about two dozen schools. “Well if I am I am. This isn’t something that’s going to go away from my standpoint. I bleed Philadelphia. There is gonna be other ways where I can help. This time, it was me going in my pocket alone, without sponsors or other people to add to it. The next time, because of the attention that this has drawn, I’ll get corporate companies to come in and get involved and help me raise money. This is definitely a start of something big for me. I’m jumping into this philanthropy world and for me, this is where I wanted it to start. How am I going to continue to raise money? I don’t know yet, that’s why I went into my pocket personally, but this is something that I’m going to take serious and go full steam ahead with it. The train of celebrities donating to Hurricane relief continued today when actor and comedian Kevin Hart donated $100,000 to relief efforts in Newark. "It was hard to hear the devastation Hurricane Sandy had on the city," Hart said at Cineplex 12, Newark's recently re-opened movie theater, as he donated $50,000 to the Newark Fireman's Charity Fund and $50,000 in gift cards from Target and Home Depot to be handed out to residents. "The good news is I'm donating all of these," the Philadelphia native said. "The bad news is I don't have the time to hand out all of these." Hart plays two shows tonight at NJPAC before continuing on a national tour. 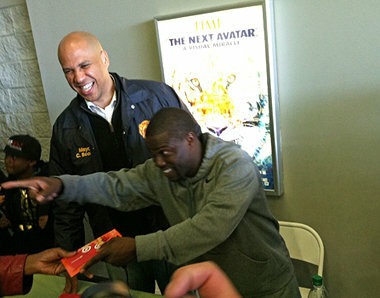 The job of passing out the cards will fall to Mayor Cory Booker, who called Hart a "soldier" in the relief effort. "It means a lot," Booker told reporters. "You can see the effect he has on folks in the community." One of those folks was Rakim Ben, 41; a South Ward resident who received one of the first gift cards. "I was out of work about four days," he said. "I'm appreciative. I'm very appreciative." Positive Black Male News: Big Sean Kicks Off Official Launch of Sean Anderson Foundation by Giving Back! Big-SeanAward Winning G.O.O.D. Music and Def Jam recording artist Big Sean celebrates the official launch of his non- ‐profit, the Sean Anderson Foundation, with a new campaign on Prizeo, the premier celebrity charity fundraising digital platform to raise funds to help bring P’Tones Records, a free afterschool recording studio music program, to Sean’s hometown of Detroit. The campaign is live on Prizeo today and end will on August 19th with the winner announced and notified on August 20th. big-sean-fanBig Sean is really in the giving spirit recently he showed up as a surprise with MTV in tow to one of his biggest fans home, who is paralyzed to play him his new album Hall of Fame. While sitting on the couch in his living room, he gave him a first listen to the August 27 release. Back to the giving which also includes some MTV Love. For micro- ‐donations starting at only $3, fans will be entered into the grand- ‐prize drawing. The grand- ‐prize winner, chosen at random, will accompany Big Sean to the MTV Video Music Awards on August 25th in Brooklyn, NY. The Sean Michael Anderson Foundation is a Michigan non- ‐profit corporation aimed at assisting in the education, health, safety and well- ‐being of Detroit Area school- ‐ age youth as well as disadvantaged youth in other areas across the nation. P’Tones Records is an organization that opens studios nationwide and provides teens from disadvantaged neighborhoods the opportunity to partake in a hands- ‐on afterschool music program, running a mini- ‐record label set in a recording studio environment. “We are delighted to partner with Big Sean to raise both funds and awareness of the mission of the Sean Anderson Foundation and P’Tones Records,” says Leo Seigal, Co- ‐founder of Prizeo. As extra incentive, Big Sean will reward fans of certain, stipulated donation levels with a range of exclusive rewards including his highly anticipated new album Hall of Fame which will be released on August 27th, autographed Aura Gold merchandise and Hall of Fame Sol Republic Headphones. And the campaign’s top sharer —the donor who shares a personalized link to Sean’s Prizeo page on Facebook and Twitter and gets the most friends and family to contribute to the cause—will win a pair of the new and exclusive Big Sean designed Adidas Sneakers, as well as a follow by Big Sean on Twitter and Instagram. Congrats to Big Sean on the launch of his foundation and to our friends at P-Tones on this endeavor. Be sure to support it BCG Family, Giving is Good! Ethel “Ellie” Hylton has always been a high achiever. Perhaps it runs in the family. As the niece of news anchor Soledad O’Brien, Hylton’s personal achievement in graduating from Harvard College with the highest GPA in her class might not come as a surprise. Hylton, who graduated this year with a degree in sociology, was honored with the Sophia Freund Prize, which is given to the Harvard student with the highest grade point average graduating summa c*m laude. She was also inducted into the Phi Beta Kappa Society last fall. Hylton credits the support of her parents (who also graduated from Harvard magna c*m laude in 1982) with much of her ability to attain success. “I feel like I owe everything to my parents,” Hylton said. “They have been the most supportive people in my life. They always have supported me academically and [in] my extra-curricular activities. My parents never really pushed me in any particular direction. I never felt pressured to achieve because of my parents. Los Angeles, October 3, 2013- Alumnus Mr. Kim L. Hunter announces a $30,000 contribution to The University of Washington’s (UW) Office of Minority Affairs and Diversity (OMA&D) to develop the Kim L. Hunter Internship Support Fund. This support fund will enhance OMA&D’s ability to maintain the economic development of underrepresented students who major in Business with an emphasis in marketing, advertising or communications. OMA&D works to increase diversity on campus and enrich the collegiate experience through programs such as academic counseling services, the Educational Opportunity Program and the Instructional Center. Their programs currently serve more than 13,000 middle and high school students with college preparation and more than 4,900 undergraduate students with academic advising, instructional support or financial aid. As a result of their efforts, the number of applications received from underrepresented students has increased by 57 percent and UW freshman underrepresented enrollment has increased by 23 percent over the last five years. Understanding the invaluable experience gained from internships, Hunter’s support fund will provide students with industry experience and career development. During his time as an undergraduate, Hunter participated in multiple internships with major companies such as IBM, Xerox and Dow Chemical. This is not the first time Hunter has donated to his alma mater. In 2007, the philanthropist donated $25,000 to the Michael G. Foster School of Business at UW for an Endowed Scholarship fund to benefit students from an underrepresented background pursuing a degree in marketing. Hunter is also a member of the Vice President’s Club, which includes generous alumni and friends who contribute $1,000 or more annually to funds within OMA&D. Hunter brings more than 30 years of corporate and agency experience in advertising, marketing and public relations. A serial entrepreneur and diversity advocate, he currently manages three separate companies LAGRANT COMMUNICATIONS, an integrated marketing communications firm specializing in multicultural markets; The LAGRANT Foundation, a non profit organization whose mission is to increase the ethnic representation in advertising, marketing and public relations; and KLH & Associates, a multicultural executive search firm. Hunter received his bachelor’s degree in Business Administration with an emphasis in Marketing and a minor in Anthropology from the University of Washington in 1982. Dwyane Wade was inspired to start the Wade's World Foundation at the mere age of 7 years old. He recalls watching a segment of a local Chicago news station where celebrities were captured visiting school children. The featured public school children were mesmerized by the actuality that someone of such great stature would think so highly of them to come and visit. As the celebrity stooped to their levels to greet, hug, and high five the children, their eyes gleamed with excitement and their smiles lit up the room. After the celebrity read familiar story books aloud and offered words of encouragement, the children's demeanor instantaneously changed. Likened to Clark Kent becoming Superman, the children went from being ordinary school children to a generation of world changers who were excited about their education and succeeding in life. Dwyane watched that news segment in awe. He wondered why no one had come to visit his neighborhood. Why hadn't anyone come to his school to remind him or the other children that they too could change the world and achieve the impossible? He wanted to experience the same emotions and hear the same words that the children in the new segment did. That day, Dwyane decided that if he ever "made it" he would return to his community, motivate the children/youth and give back to local organizations. Well it is safe to say that , Dwyane has "made it" and has never forgotten that news segment he watched nearly 23 years ago. Founded in 2003, Wade's World Foundation stands on the shoulders of its' central purpose of promoting the education of children/ youth and its' three focus initiatives of literacy, health and fatherhood. Understanding that his life is bigger than basketball, Dwyane is a firm believer and supporter of the foundation's motto "Every Child Deserves a Shot." By primarily servicing the at-risk communities of Chicago, Milwaukee, and the South Florida region, Wade's World Foundation and partnering sponsors are dedicated to providing opportunities that enable children to overcome challenges, excel academically, and reach their maximum potential. The mission of the WWF is to provide support to various educational, health and family service programs, in particular those that benefit underserved communities. Kim L. Hunter is the founder and president/chief executive officer of LAGRANT COMMUNICATIONS, a multimillion-dollar integrated marketing communications corporation. He has an extensive background in brand marketing, crisis management, media and community relations. Hunter brings 30 years of corporate and agency experience in advertising, marketing and public relations. Aside from starting and managing three businesses (KLH & Associates, a multicultural executive search firm), Hunter is a corporate director for SCAN Health Plan, an HMO with $2 billion in revenue and 1100 employees. He serves on two committees – Audit and Compliance and Compensation. He has also served on Corporate Governance and Public Review committees, both which he chaired. Hunter's talents are no kept secret. He is frequently asked to speak at universities and seminars. He served as an adjunct professor at California State University, Northridge at the School of Journalism where he taught the course, "Diversity and the Media," for three academic years. As an advocate for education, Hunter spends time as the founder and chairman of The LAGRANT Foundation, a nonprofit organization, which provides scholarships, career development workshops, internships, mentorship and educational enrichment programs to minority students pursuing undergraduate and graduate degrees in advertising, marketing and public relations. Noted as a prolific fundraiser, Hunter raised in excess of $8.75 million in 15 years and has awarded $1.56 million in scholarships to 221 students. Hunter has an extensive public service background. He was appointed by the Mayor of Los Angeles to both the Cultural Affairs and Animal Services Commissions for the City of Los Angeles, serving a total of seven years. “The 50 Most Powerful People in PR”. Hunter has a master's degree in International Management from the University of St. Thomas in St. Paul, Minnesota and a bachelor's degree in Business Administration from the University of Washington in Seattle. 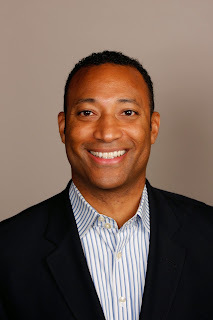 He also received certificates from Dartmouth College Tuck School of Business Administration for participating in the Minority Business Executive Program, as well as the Advanced Minority Business Executive Program. Rita F. Pierson, a professional educator since 1972, taught elementary school, junior high and special education. She was a counselor, a testing coordinator and an assistant principal. In each of these roles, she brought a special energy to the role -- a desire to get to know her students, show them how much they matter and support them in their growth, even if it was modest. For the past decade, Pierson conducted professional development workshops and seminars for thousands of educators. Focusing on the students who are too often under-served, she lectured on topics like “Helping Under-Resourced Learners,”“Meeting the Educational Needs of African American Boys" and "Engage and Graduate your Secondary Students: Preventing Dropouts." BLACK GIRLS ROCK! Inc. is 501(c)3 non-profit youth empowerment and mentoring organization established to promote the arts for young women of color, as well as to encourage dialog and analysis of the ways women of color are portrayed in the media. Since 2006, BLACK GIRLS ROCK! has been dedicated to the healthy development of young women and girls. BLACK GIRLS ROCK! seeks to build the self-esteem and self-worth of young women of color by changing their outlook on life, broadening their horizons and helping them to empower themselves. For the past five years, we have enjoyed the opportunity to enrich the lives of girls aged 12 to 17 years old through mentorship, arts education, cultural exploration and public service. At BLACK GIRLS ROCK!, young women are offered access to enrichment programs and opportunities that place special emphasis on personal development through the arts and cooperative learning. By speaking to the next generation in their formative years about issues of self-worth, goals and aspirations, the organization reinforces the message that young women need not objectify themselves or relinquish their autonomy. BLACK GIRLS ROCK! has boldly taken on the crisis of our female youth of color here in America head on and understands the need for positive self-images and a strong sense of awareness. WE SEE SOLUTIONS. BLACK GIRLS ROCK! Inc. continues to partner with BET Networks in the worldwide broadcast of BLACK GIRLS ROCK! The event continues to be a historic and monumental show highlighting the accomplishments of exceptional women of color who have made outstanding contributions in their careers, and who stand as inspirational and positive role models in their communities. Don’t miss this year's BLACK GIRLS ROCK! on Sunday, November 3, 2013 at 7P/6C. For more information about Black Girls Rock, Inc., check out their website.